Goal 4 of the UN Sustainability goals fully reflects the core mission of Universcience, the public institution that encompasses the two biggest science centers in Paris, the Palais de la Découverte and the Cité des Sciences et de l’Industrie: popularizing, engaging, and making science accessible and attractive to everyone and especially to the young public. How? By encouraging dialogue between research, science, and society; promoting a scientific approach; stimulating the curiosity of our young visitors; introducing them to scientific experimentation; or encouraging them to choose careers in science and technology. Universcience, like other science centers, remains a privileged and recognized place for learning, as it offers emotion, immersion, interactivity, and sharing through a range of activities: exhibitions, workshops with human science facilitation, resource spaces, events, debates . . . . In that sense, Universcience, along with science centers and science museums, but also all the other players in the informal education ecosystem, has a mission of citizenship. It strives to offer the most inclusive and equitable life-long education to all its visitors, setting up gateways between science and society and highlighting questions raised by progress and innovation (environment, geo-economics, ethics . . .). And the acceleration of digital developments will help us to serve education but also democratic processes. Addressing a new kind of citizen, very active and permanently connected, leads us to adopt a more participatory and experimental approach, based on collaborative spaces, like the Fab Lab (a participative fabrication laboratory), the Living Lab (a collaboration of the public on the elaboration of innovative digital displays), and a new scientific media library. We are also able now to involve our visitors more, thanks to the digital social networks, in the production of content. Along with our core mission, the diversity of Universcience programming could easily match with each and every SDG. For example, our two permanent resource areas open to everyone free of charge, the Job Centre, and the Health Centre which provide a wide range of facilitation to assist career choices (Goal 8, “Promote inclusive and sustainable economic growth, employment and decent work for all) and public health (Goal 3, “Ensure healthy lives and promote well-being for all at all ages). For the International Science Center & Science Museum Day, Universcience would like to emphasize two initiatives, the Climate 360° exhibition and the recently opened Urban Mutations exhibition. As always, our exhibitions are presented with a set of science explanations and shows, especially developed on those specific themes, for school groups and families. The Climate 360° exhibition illustrates Universcience’s action about Goal 13, “Take urgent action to combat climate change and its impacts”. It was conceived by our team of scientific journalists to coincide with the United Nations Climate Change Conference in Paris at the end of 2015. The exhibition, which toured the world in the network of French Institutes and Embassies in 20 countries, took a closer look at the issues raised by the increase in greenhouse gas emissions produced by human activity. It aimed to engage scientists and members of the general public in discussions on those current issues. During COP21, Universcience was proud to welcome Youth4Climate, a videoconference led in collaboration with the international networks of science centers. This conference presented Youth Climate Summits (initiated by the Wild Center and ASTC) from different continents and put them in perspective with comments from climate experts. Those actions joined an initiative showcased in the Climate 360° exhibition: role-play sessions of secondary school students from the Paris region, exploring the challenges and mechanisms of the round of negotiations. A second exhibition, Urban Mutations, is currently on view at the Cité des Sciences et de l’Industrie until March 2017. It offers a multidisciplinary approach about this broad subject, and it supports, of course, Goal 11 (“Make cities and human settlements inclusive, safe, resilient, and sustainable”) along with Goal 9 (“Build resilient infrastructure, promote sustainable industrialization, and foster innovation”) , Goal 10 (“Reduce inequality within and among countries”), and Goal 12 (“Ensure sustainable consumption and production patterns”). Some case studies also points out subjects like poverty (Goal 1, “End poverty in all its forms everywhere”), energy (Goal 7, “Ensure access to affordable, reliable, sustainable and modern energy for all”), and work and growth (Goal 8, “Promote inclusive and sustainable economic growth, employment and decent work for all”) . . . . The exhibition reminds visitors that by 2008, half of all people in the world were living in cities and that now, every second, two people join the urban dwellers. It shows that this phenomenon has far-reaching implications for our cities and hence for our lives, and that many initiatives and innovations–industrial, political, grassroots–could help us meet this challenge. 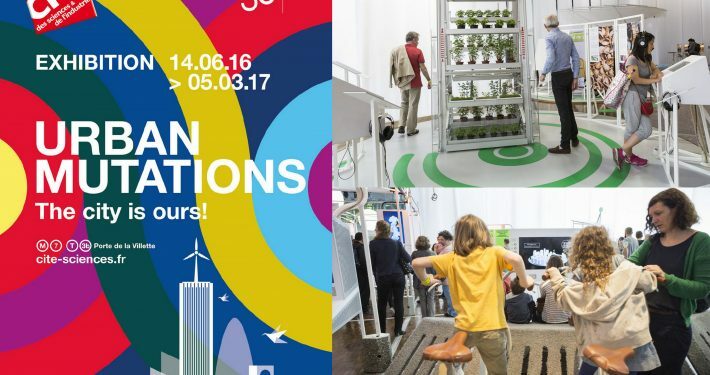 A selection of them is presented to the general public in the exhibition (the model of a vertical farm, Skygreen in Singapore, the Biobus in Bristol, the collaborative “OpenStreetMap” . . . . Visitors are invited to participate in the dialogue by enriching the exhibition contents with their contributions, thanks to a set of interactive and immersive devices (Oculus Rift, polling devices . . . ). We would like our public to have the means to have an active and informed role in the transformations of our cities tomorrow, based on an understanding of demography, new technologies, environment . . . . This is a highlight of two initiatives illustrating thematic actions promoted by SDGs, completing the core educational mission of Universcience. As stated in Goal 17, “achieving those ambitious goals requires an enhanced global partnership,” we as science centers need more collaborative initiatives and more partnerships with public and private stakeholders, as declared in the Mechelen Declaration: “reinforcing collaboration will advance issues related to the public engagement with science and technology at a higher strategic level than before.” Universcience is proud to share ideas with colleagues and thus contribute to the reflection on the science centers initiative for the 2016 International Science Center & Science Museum Day.